Clay’s Hunter Mathias finished with a game high 18 points in the Panthers home loss to Peebles on Tuesday. PORTSMOUTH – Home losses are never easy, especially one where you have a couple of opportunities to give yourself a chance down the stretch. Ultimately, despite those chances, the Clay Panthers (5-9, 3-6 SOC I) fell to the Peebles Indians 53-51, a game in which they led 34-33 going into the fourth quarter. 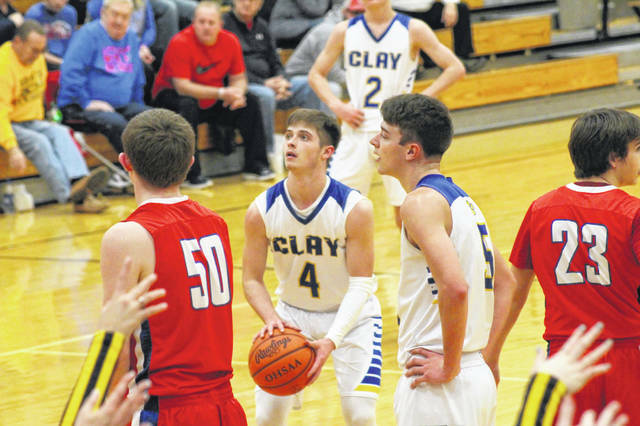 Clay played a solid second and third quarter on the defensive end against Peebles, limiting the Indians to just 16 points collectively in the middle two quarters (six in the second, ten in the third). The problem? The first and the fourth. In the outer two quarters, Peebles put up a combined 37 points including 20 in the final frame. Hunter Mathias had one of his best offensive games of the season for the Panthers by scoring a game high 18 points, and Reece Whitley’s two big threes in the first part of the fourth quarter helped contribute to his 13 point outing against Peebles. Sophomore Shaden Malone showed at times, especially on his two drives in the fourth quarter that resulted in baskets for Clay, why he has so much potential. Malone finished with eight points for the Panthers on Tuesday. Peebles was led in scoring by Oakley Burbey and Weston Browning who finished tied with a game high 18 along with Clay’s Mathias. There are always lessons to take away from a close loss. More often than not, the lessons learned from that loss will help you down the road, and that’s what Anderson is hoping for his squad as we approach tournament time in the middle of February. Clay finds themselves back in action on Friday when they will host New Boston. Peebles: 20 FG, 5 3PT (Browning 3), 6/13 FT.